Largest Charter Fishing Boat on Northern Lake Michigan! Plumber’s Helper Charter Service is located at beautiful Bay Harbor Lake Marina in Petoskey, Michigan, and offers morning, evening and occasional midday trips. Be sure to reserve early, as our schedule fills up quickly. 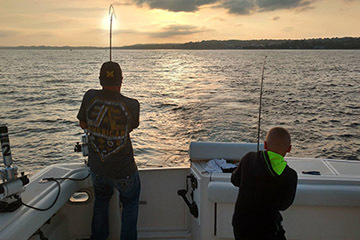 Plumber’s Helper Charter Service also offers boating excursions for those who don’t care to fish but just want to get out on the water for a cruise on Little Traverse Bay in Northern Lake Michigan. Great Lakes fishing at its best, with over 30 years’ experience. Helping to make fun memories in Northern Michigan that will last a lifetime. If You Don't Catch Fish, You Don't Pay! Northern Michigan Fishing at its Best - With Over 30 Years' Experience! 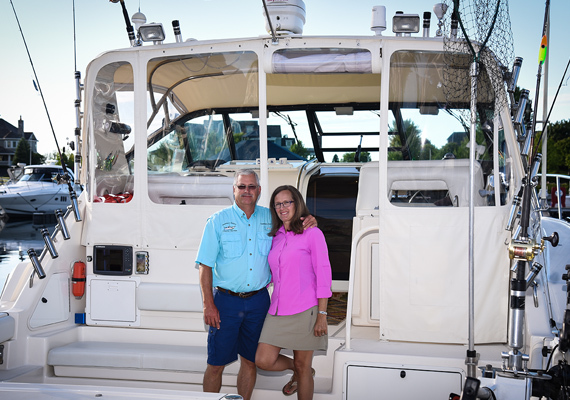 Whether you’re a novice at fishing or an experienced angler, Captains Jim and Kim Musselman will do all it takes to ensure you have a memorable fishing trip on Lake Michigan. Our 43-foot Tiara Open sport yacht is equipped with top-of-the-line fishing tackle and electronics to make your trip a success. If you don’t catch fish, you don’t pay! 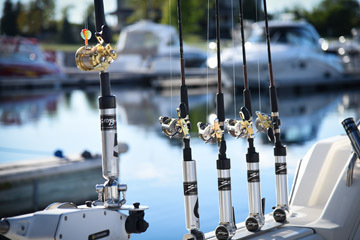 Our seasoned captains have over 30 years of experience in Great Lakes tournament and charter fishing. 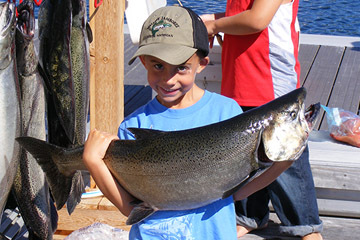 Fish the best spots for catching lake trout, salmon, steelhead and more. To Reserve Your Trip, Call Us Today!